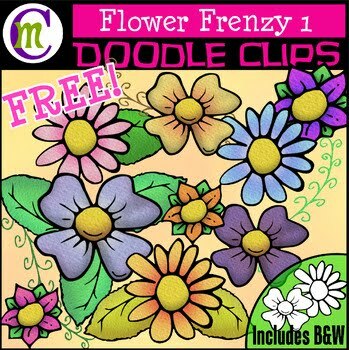 Who wants a spring clipart FREEBIE?! Great for adding a punch of color to covers, or to embellish your spring, Easter, or Earth day resources, these doodle flower illustrations are just the thing :) There are 5 different images, each in 3 different color variations. White-filled blacklines are also included. Enjoy! What Are Doodle Clips? Doodle Clips are images created from sketching traditionally (on paper), inking (blackline), then coloring either traditionally (with markers, pencils, or paint) or digitally. They tend to have a much more organic feel, and AREN'T composed of perfectly straight lines. There is beauty in imperfection, which is what I love most about Doodle Clips!